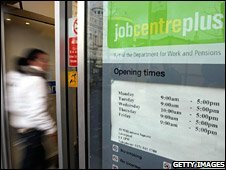 Almost everyone on benefits should be preparing themselves for work, says a report commissioned by the government. Lone parents with children aged one to seven should sign an action plan to help them return to work, under plans drawn up by welfare expert Paul Gregg. And there would be punishments for all those who do not cooperate, from losing benefits to unpaid community work. A Welfare Reform Bill, due to be in the Queen's Speech on Wednesday, could include some of the recommendations. The proposals would see tougher sanctions, not just for those on Jobseekers' Allowance but also for those on the new employment and support allowance, which includes lone parents. Until recently lone parents did not have to seek work to claim benefits until their youngest child was 16 - but that is being reduced to 12. By October 2010, those whose youngest child is seven or over will have to seek work. But Professor Gregg's review of welfare reform options, suggests lone parents with children aged between one and seven should prepare themselves for work. They would be included in a new category of claimants, alongside people on incapacity benefit deemed capable of work, where an immediate return to work was not appropriate but was possible "with sufficient time, encouragement and support". They would have to attend work-focused interviews, agree an action plan to help them return to work and take part in "work related activity" between each interview. It also says there should be a group expected to make a prompt return to work - including lone parents with older children and Jobseeker's Allowance claimants. And there should be a group with no requirements on them to seek work - made up of some carers, lone parents and partners with children under one and people with serious illnesses. Professor Gregg, from Bristol University, said sanctions should be clearly outlined and for those considered ready for work there would be "short, sharp, not-that-severe monetary sanctions" if they did not stick to their agreed action plan. Unemployed people who do not turn up to meetings should get a written warning for the first one missed, and lose a week's Jobseeker's Allowance for every time after that they did not follow their conditions. The government is already facing backlash over its income support changes. One senior adviser has suggested they should be put back because of rising unemployment. Professor Gregg's recommendations have not yet been adopted by the government. But Mr Purnell welcomed them and said the "direction of travel" was right, although he said he would consult further on the issue of non-financial sanctions. He rejected calls to slow welfare reform during the economic downturn saying: "When jobs are harder to find, we need to invest in those people who will one day be back in work so they don't lose touch with the labour market." He said he would respond in full later this month. But his Conservative shadow Chris Grayling said: "I have lost count of the number of documents the government has published promising radical welfare reform in the past few years, but they never seem to get on with the job of delivering that reform." Labour backbencher Nick Palmer said there should be a "slow graduation" from helping people with personal problems to helping them start to prepare for work. He told BBC Radio 4's The World At One: "What I wouldn't think is realistic is to expect parents to have a plan to get back to work when the child is only one - I think that's not going to happen in practice." The Lib Dems said it was right that more people should be encouraged back into work but what was needed was quick and effective help not "tough talking and endless reviews". TUC general secretary Brendan Barber said: "This approach to welfare assumes a utopian world of unrestricted childcare and widely available jobs where only the lazy opt for life on the dole. "The reality is very different. Thousands of people are joining the dole queue every day through no fault of their own." The review and the government's welfare reform proposals were the "main item" at Tuesday's cabinet meeting, Prime Minister Gordon Brown's spokesman said.